About 50 million children returned to school this week, and nearly 20 million of them are getting free lunch. The number of children fed through the National School Lunch Program has expanded dramatically in the last few decades. This is partly due to the growing number of children living in poverty. In 2013, 21% of kids were living in poverty compared with 15% in 2000, according to the National Center for Education Statistics. But administrative changes have also impacted those numbers. While families typically had to report their income every year to qualify, now whole school districts can decide to provide universal coverage -- meaning free lunch for every student. Major cities like Chicago, Dallas and Philadelphia have decided to do just that in an attempt to reduce paperwork and any stigma associated with the free lunches. The School Breakfast Program is expanding even faster. Last year, free breakfast was served to more than 10 million children. Many school districts have started serving breakfast in the classroom, rather than in the cafeteria, to increase participation. Study after study has shown that breakfast in school (and specifically in the classroom) helps children learn and improves academic performance. None of this is cheap. Taxpayers spent $16 billion feeding kids breakfast and lunch last year. But on a per-meal basis, it's just a few dollars. This school year, the maximum amount that districts will get from the federal government per child is $1.99 for breakfast and $3.30 for lunch. And, after accounting for things like labor and kitchen equipment costs, only about half of that is spent on actual food, according to the school district for Bridgeport, Connecticut. 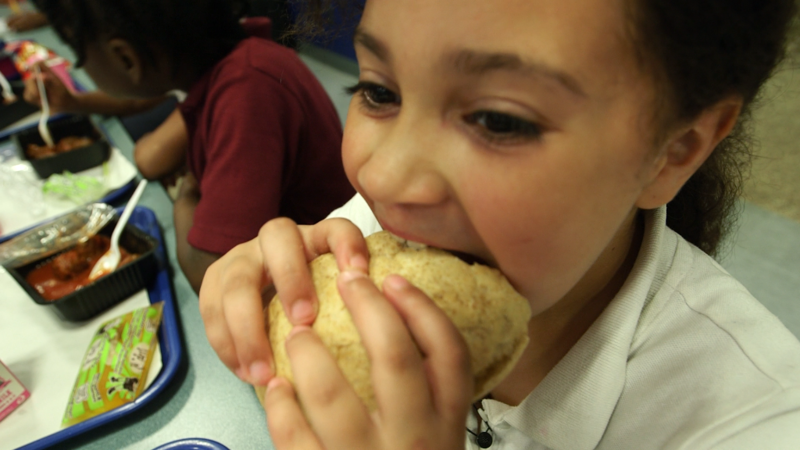 "I think that the people that are trying to make those small amounts of money stretch and feed all of these children have one of the hardest jobs," says Marlene Schwartz, director of the Rudd Center for Food Policy and Obesity. "It would be great if there was more funding for them." Also, putting pressure on the budgets is a push to serve healthier foods. The USDA updated its regulations for school lunches 3 years ago, requiring districts to offer more fruits, vegetables and whole grains, and less sodium and fat. But 69% of the districts surveyed by the School Nutrition Association said the new rules have harmed the financial health of their nutritional programs. Despite the added costs, critics say there's still room for improvement. The tomato sauce in pizza counts as a vegetable, for example. Many districts are serving prepackaged, branded products like Aunt Jemima Pancakes and Pillsbury Mini French Toast. Food companies make these products specifically to meet national guidelines so they are whole grain and have less sugar. But Schwartz says they effectively work as advertising to children so kids become loyal to the brand's less nutritious offerings outside the school. Nearly one-quarter of districts surveyed offered restaurant-branded foods, such as Domino's pizza. The National School Lunch Act was passed in 1946 "as a measure of national security, to safeguard the health and well-being of the Nation's children." The current law expires this month. To keep funding going, Congress must reauthorize it before September 30th.